How to order your paint masks . . .
First thing is to make contact with me well before you are ready to apply any primer. If your requirements needs something more than basic insignia, such as nose art or motifs get in touch at least 3 months before. Paint Masks are easy to manufacture, but making them the right size takes a few mails to check sizes if I am not farmiliar with your model or if there is a complex scheme involved. To contact me simply send me a message from the contact page Click - here. After you send the message you should receive an automated e-mail confirming your message. I will probably reply in person not too long after that. Note: If you do not receive the automated reply you should send another message as you will have typed your e-mail address incorrectly and my reply won't get to you! Time to get in touch! If your model looks like this then you should be talking to me about your Paint Masks! 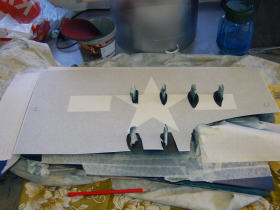 If you require service marks (maintenance stencils) for your model you should check the reference list at the lower part of my Dry Rubdown decal page. If your model is not listed then I have no current plans to start drawing them up. This does not mean I won't supply you with anything, but it generally indcates I don't have any details to work on unless you can supply the relevant information. If you are basing your model on a specific aircraft and you have pictures it would be useful to have a few relevant images. 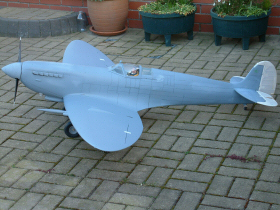 It is most helpful if you can specify the scale of your model and if available the wingspan (I like to check). Any unusual markings that you require should also be mentioned such as sortie marks, kills etc. I believe it is very important for people to know exactly what they will receive. For that reason I carefully prepare a proof swatch which details everything that will be supplied including those all important dimensions. Where necessary (and if it's possible) I will supply items for you to print and offer to the model to see if the size is roughly correct. This is useful for smaller insignia and unusual items where we have no information on dimensions. 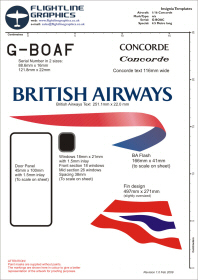 Shown left is the proof image used for Ivan Goodchild's huge 2.5M span Electric Concorde. When you receive your masks you will be able to identify everything by its shape or a label cut into the vinyl. A guidance sheet will explain what each mask is for and the colour it is used for. If you have any difficulties or miss haps with the decals in use don't struggle or try to work around the issue, just get in touch and we will resolve the problem and get you back on track. I take great pride in working with my customers to give them the best service possible! A very involved application! Steve Carr from Steve's Warbird Factory shows how to get around rocket mounts when adding insignia.